I live in a cave. Not literally, but it sure feels like it. My house is so dark. Even with the windows wide open, on a bright sunny day, I still have to shoot at a minimum of ISO 1600. Sometimes I embrace my cave, I shoot with the high ISO, and I don’t sweat it. But, honestly, the images that I love, the images that I keep, the images that I share of my family in my home almost alway use my flash aimed at a corner of my ceiling. Because it is flexible and easy. There are lots of ways to bring in extra light to shoot indoors from strobes to flashes, and many tools to modify them. But houses often have white ceilings and windows. Both of which are easy to bounce light off of. Walls and windows often reflect back a flattering light. No modifier needed. Just your flash, pointed to where you want the light to come from. I’ve heard people refer to the light coming out of a flash like water coming out of a hose. You hit it against a surface, and it scatters and bounces back at you. This is a pretty accurate way to look at it. When I put the flash on my camera, I think about that water. What wall do I want to bounce off of to have it come back where I want it to? Your flash doesn’t have to point straight ahead, or straight up with a bounce card or modifier. Turn it to an angle, and to the side, play and watch where the light falls. 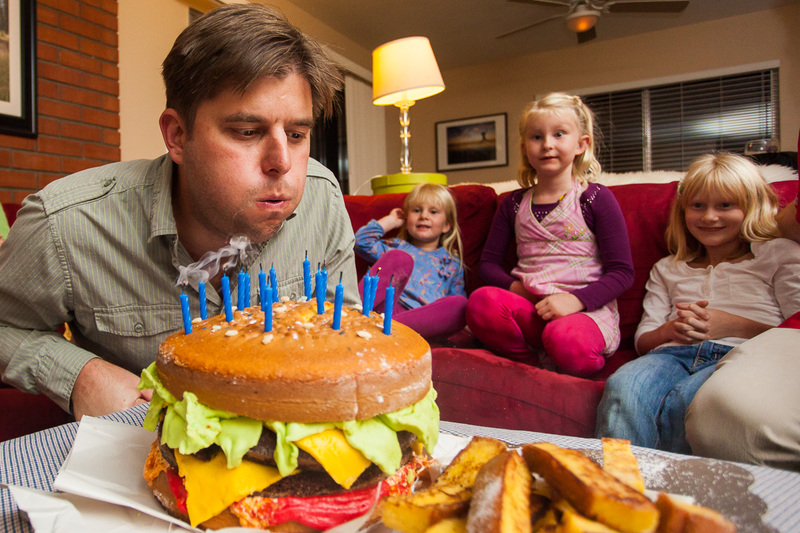 In this image of my Brother-in-Law blowing out the candles on his hamburger cake, you can see that the flash is pointed a tiny bit in front of me and to the right. It shows in the window behind my couch. If I was to do it over again, I’d move the light behind me more, in front of the kids, so my daughter on the right wasn’t lit only on the top of her head. Moving the light behind me or towards the front of her would change how the light hit her face. It wouldn’t have been blocked by my enthusiastic husband who leaned in (just out of frame) at the moment my brother in law took his breath to blow out his candles. It would have been an easy change to make at the time, had I accounted for my light-blocking husband. With just a little turn of the flash angle, I was ready for the next shot. Even before I take my first shot, even if it is just casually shooting my brother-in-law eating cake, I think of the angle of the light. If it isn’t where I want it to be, even if the exposure is near what I want, I grab my flash. I angle it so it bounces where I want. It is far easier for me to grab my flash than to tell my family to move to the good light. If I try to move them, the moment will be lost, and I’ll have some pretty angry hungry people to contend with. I want them not to mind them documenting their lives, and bouncing flash is a great way to capture lasting memories in my dark cave of a home. So please, if you haven’t already played with bounced flash indoors, just try it. If you have it sitting in you bag, taking up space, waiting for the right moment to practice, now is that moment. Just try it. It’s a piece of cake. Maybe not a piece of hamburger cake, but it really is easier than you’d think. If you are inspired and give it a shot, please reach out to me. I do want to see what you’ve done. I need to play with my flash more thanks for this article!